What would a turkey be without a wattle? (Or waddle, as I always thought it was spelled.) 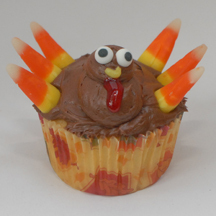 Thanks to decorating gel in a tube, you can outfit your Thanksgiving turkey cupcakes with one. What You Need: 1 cupcake; chocolate frosting; 6 candy corns; 2 candy eyes (or just use small candies); yellow writing icing in premade tube or pastry bag; red gel writing icing. How to Make It: Frost cupcake. Load chocolate frosting into a pastry bag fitted with a #12 metal tip and coupler. Pipe large blob for neck and smaller blob for head. Add eyes. Use yellow writing icing to draw beak. Use red gel for wattle. Stick 3 candy corn on each side of cupcake for feathers. This entry was posted on Sunday, November 23rd, 2008 at 6:54 pm	and is filed under Thanksgiving cupcakes. You can follow any responses to this entry through the RSS 2.0 feed. Responses are currently closed, but you can trackback from your own site.